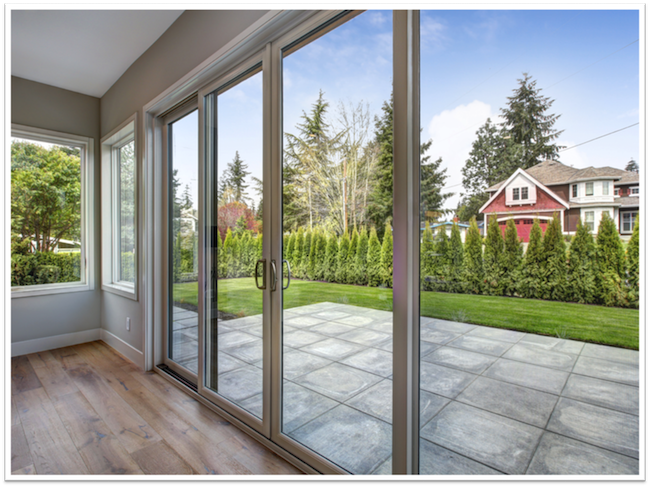 We all feel the need for a home makeover from time to time, and while glass can be used in virtually any part of a house, there are four rooms where it has special power to make a difference. Bathroom – The bathroom is often a key focus in a home makeover, and you might be surprised at how dramatically you can change this space by the addition of glass. 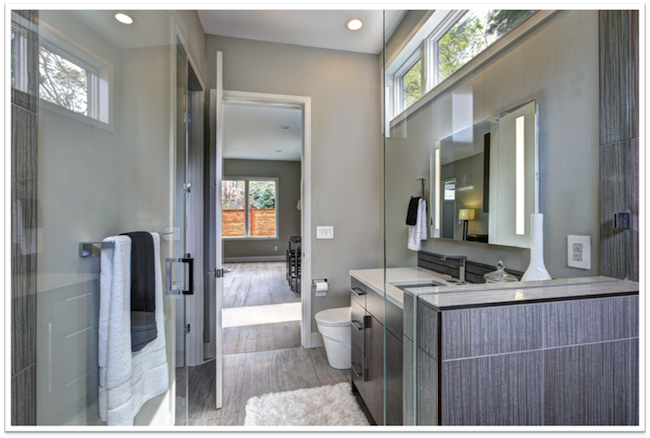 • Shower doors: Enclosing your existing tub with clear glass gives it an up-to-date look and makes both the bathroom and the shower area feel larger. • Vanity mirror: Installing a nicer mirror above the vanity can make this part of the room shine. Possibilities include a framed mirror, a beveled mirror, or a custom mirror. • Glass partition: Using frosted glass to separate the bathroom into sections can make it functional for multiple users. This is also a design technique used for keeping the focus off less attractive fixtures, such as the toilet. • Glass shelves: This shelving can solve your bathroom’s organizational issues while also bringing clean lines and pretty glass to the space. Kitchen – Kitchens can also benefit from a makeover involving glass. If you don’t like your cupboards, consider refreshing them with cabinet glass instead of doing a full replacement. Available in clear, patterned, frosted, and tinted styles, cabinet glass can take the place of the existing panels on your cupboard doors. This switch will immediately update your cabinetry and give the whole kitchen a new style. Another way to transform your kitchen is by having a glass backsplash installed. These seamless or mostly seamless backsplashes are easy to clean and allow you to tastefully incorporate a contemporary look into your kitchen. Since glass backsplashes are available in any shade you desire, they can even be used to bring color to a neutral space. Dining Room – Both a dining table and a china hutch can be improved by glass. A glass tabletop is the perfect way to give your table a fresh style. Table coverings can be made from clear, frosted, tinted, or back-painted glass, depending on your decorating goals. Clear glass for instance, keeps the table’s surface visible but adds sheen and a sleek texture. On the other hand, a top made of back-painted glass will totally hide the existing surface for a very modern table design. A china hutch can be upgraded by replacing some of the wood components with pristine glass. Utilize cabinet glass and glass shelves to beautify an old hutch and make it a charming element in your dining room design. 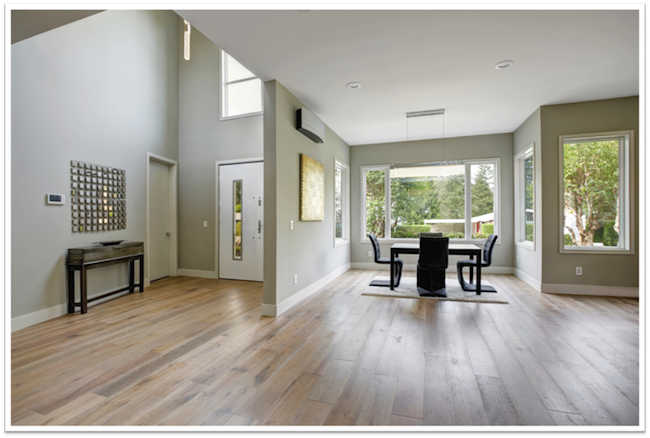 Home Office – If your home work station is a place you dread spending time in, a décor makeover can help. You might neglect to beautify this space, especially if you dislike your job, but improving the ambience of a home office can improve your mood while toiling in front of your computer! • Have a skylight made of laminated glass installed. This will safely let in lots of natural light to keep your office bright and cheery. • Hang a custom whiteboard made from white back-painted glass. This doubles as a contemporary wall hanging and a place to write reminders, lists, and schedules. • Use glass shelving to organize your office supplies. This is another installation that is both aesthetically pleasing and practical. • Place a framed mirror opposite a window. Choose a piece that is attractive in its own right and then use it to give the appearance of a second window.